I went on a blind date with a book. Sometimes the books carry descriptions; sometimes they don’t. Many libraries had featured these displays for Valentine’s Day; some do it year-round. A few bookstores even get in on the action. • a rebel band of outsiders on a comic quest. Adventure, danger, storytelling, friendship. You’ll laugh, you’ll cry, it will become a part of you! I couldn’t resist this contender: a masterpiece you probably haven’t read yet. Rich, intense, beautiful. While I was paying, I asked the clerk about the brown paper packages. She said they’d only started the week before, and customers and employees were both loving it. Plus, those books were selling. 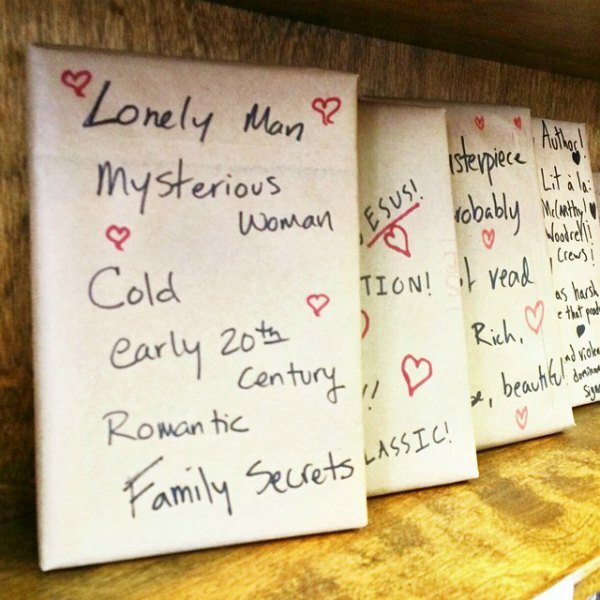 The blind date concept lets the store’s employees (they all get to play) choose exceptional books to put in their readers’ hands. You have to be confident about a book to let a customer buy it sight unseen. The biggest motivator for most blind date purchases—and this is certainly true for mine—is the fun factor. I purchased My Brilliant Friend by Elena Ferrante, whom The Economist called “the best contemporary novelist you’ve never heard of.” I hadn’t read it, but I recognized it immediately: it’s been pinned several times to the 2015 Reading Challenge board as a book in translation. 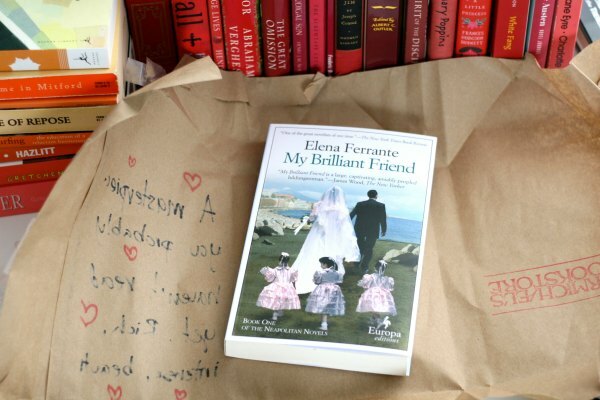 My Brilliant Friend is the first installment (published in 2011) of Ferrante’s Neapolitan Quartet: the final novel is due out this September. The quartet revolves around the friendship between Elena and Lila; My Brilliant Friend begins when the girls are in first grade and carries them through adolescence. About my date: I had high hopes based on the description, but knew I could check the most difficult box on the reading challenge regardless. I had a hard time getting acclimated to the story: the book begins with a lengthy list of characters, as in a play, and I found myself constantly flipping back and forth to try and figure out who was who. Like many books in translation, I was slow to catch the rhythm of the language. It took me a little over a hundred pages (out of just over 300) to get my bearings and sink into the setting: the girls’ violent slum in 1950s Naples. Ferrante paints a deeply realistic picture of their small world of cruel poverty, domestic abuse, and the rule of the Camorra mafia. The girls dream of something more, but it’s clear to the reader that only one of them can break free. Ferrante’s realism—and the impending sense of doom—made this an emotionally challenging read. I found it beautiful and sad, wistful and heartbreaking. When I began the final chapter, I wasn’t sure if I wanted to continue the series, but the book’s closing image was perfection. I need to know what happens next. I’m calling my first literary blind date with a book a success. I’ll do it again, as long as my bookstore is ready with more enticing novels wrapped in brown paper. 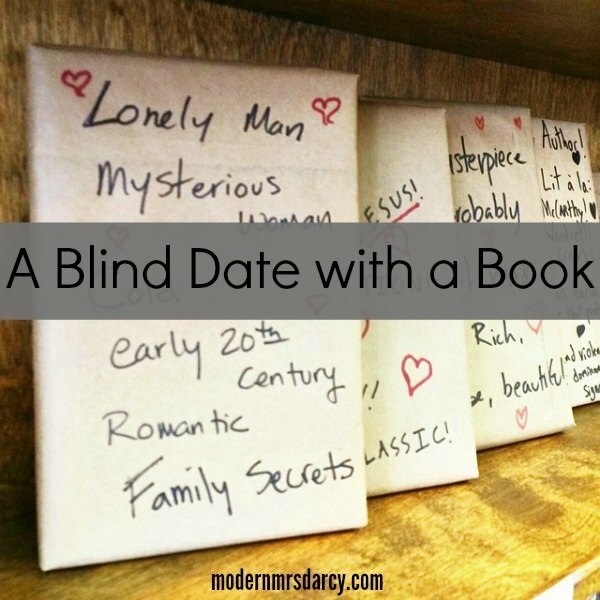 Have you gone on a blind date with a book? Have you let someone set you up with a novel you were skeptical of? Would you try it? I’d love to hear about your experiences in comments. 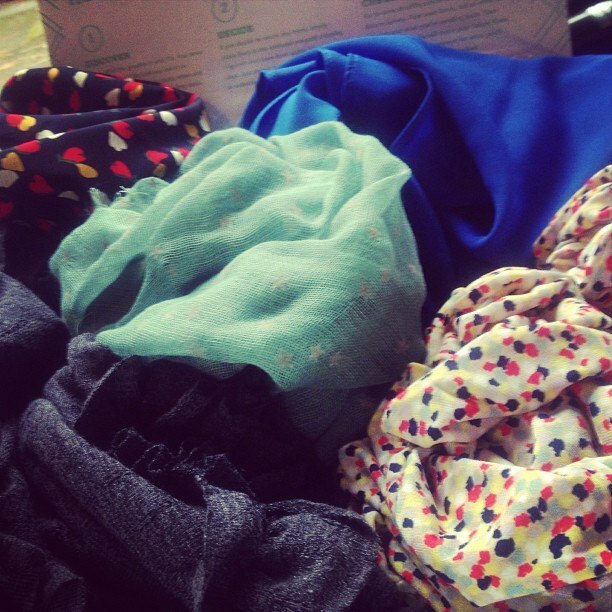 Next:13 things I’ve learned in 30 months of Stitch Fix (aka my best Stitch Fix tips). I go on blind dates with books if my sister is the one who sets me up with them–just like I would have trusted her to set me up with a real date before I met my husband. I think it would take a real leap of faith to be set up by a stranger. So many books out there and so little time! I love this idea! I’m going to have to browse around and see if I can find a bookstore or library in my area who does this. I’d definitely give it a try! Jane Eyre was 19th century. And is most definitely not a family series! It does make you curious, though. My mistake! My mind saw “family secrets” instead of “family series!” I mistook the century as well. This is a perfect example of why I shouldn’t post comments first thing in the morning, haha! Well, for the record, it does say “family secrets” and I thought Jane Eyre as well, but the 20th century part is still a problem. It makes me curious though. Ack…you’re right! My morning brain saw series. Must drink more caffeine. Family secrets it has in spades. Now I want to go quiz all the bookstore employees to find out what books were behind those descriptions! I haven’t done this, but I love looking at the descriptions at my library and trying to guess what they are. I agree with Courtney above — has to be Jane Eyre! How intriguing! I’ve never heard of this, and I’m not sure I’d plunk down money to buy a blind date book, but I’d definitely check one out from the library! I’m horribly guilty of judging a book by it’s cover, and in our pinterest world–I’m surprised that so many books have such meh covers. I’m glad your first blind date was a success! My book club chose “Those Who Leave and Those Who Stay”, which is the third book in that series, for our most recent pick. So it was kind of like a blind date. I felt similar about flipping around trying to figure out who everybody was. It’s like a Russian novel too, with all the different nicknames for the same person. It also took me a while to get into it, but I was glad I read it. There’s a lot to discuss in Ferrante’s portrayals of friendships and family relationships. Also, the story of Ferrante herself as an anonymous author is very intriguing. No one knows her real name! I didn’t know that until I started googling to find out when the fourth book was coming out. Reading about the author makes for a great story in and of itself! This is too fun. Kudos to you for reading it. I might have bought it, opened it, and not read it if I didn’t think it looked good…..not fun. 😉 That’s bailing on the blind date. Ha! Also, I saw a local library branch do this once, though the descriptions weren’t as enticing. This is such an intriguing idea, and one that I had never heard of prior to reading this post. I would love to be set up on a blind date with a book. Fun idea to get someone to read a book they haven’t read before. Wouldn’t that make a fun party idea/gift exchange? A literary experience! Yes, such a fun party idea or gift exchange! I would have loved doing this for my students during my teaching days! I’ve checked out a blind date book at my library and loved it. They only did it at valentines day and I wished they do it year round. I tend to be easily scared off by the jacket copy, I really should just stop reading it! Also, I’m dying to know what that last one was! “a rebel band of outsiders on a comic quest. Adventure, danger, storytelling, friendship. You’ll laugh, you’ll cry, it will become a part of you!” I think I’d love this book! Maybe it’s Mr. Penumbra’s 24-Hour Bookstore? That is kind of what that description sounds like to me! I keep thinking this one is The Princess Bride. I would definitely do that! At least once. It is so fun. I’ve never seen a display like that before, but I think it’s wonderful! I saw a table of these at my local bookstore around Valentine’s Day but I haven’t been in since then to see if they continued. I’d be so afraid that I’d select a book I’d already read (so many of my local store’s recommendations are old news for me for some reason). It would be so great if my library did it! I would LOVE to go on a blind date with a book! That sounds like a lot of fun. I read My Brilliant Friend as a not-blind read, to satisfy the “book originally published in another language” task on a reading challenge I’m doing, and I really didn’t love it. Though the ending intrigued me, I won’t be continuing the series. I love this! I’ve never seen this idea before, but I’m going to incorporate it in my own home. I have three sons, and it’s like pulling teeth to get them to read something that’s from a new author or genre. Each summer I make a list of appropriate books for each son, check out mountains of books from the library, and then beg and bargain to get them to “test-drive” (at least 50 pages) a book from my stack every week or so. This year I’m going to steal this genius idea! Wrapping the books and giving enticing clues will create just the excitement and anticipation i need. Given my audience, I’ll nix the hearts and “blind date” talk and go for more of a mystery/intrigue angle. Thanks for sharing! That made me laugh! Love the idea and how you’re customizing it for your boys. That’s a totally good idea! I hope it works for you! I’ve never done this quite like this before, but I love the idea of it!!! In the past, I’ve had friends and librarians recommend a book or an author and tell me nothing about it other than they really liked it. That’s how I’ve discovered many a favorite book. A few years ago, I asked my Mom to pick out three books for me and I committed to reading at least 3 chapters before deciding to give up or continue. I loved 2 of them!!! And…Sometimes, I’ll go to the library and pick a book that the library chose for the main display area without opening it up or knowing anything about it. I’m rarely disappointed with that strategy! I love this idea! I’ve never “gone on a blind date” with a book, but I DO feel like my book club creates a similar experience for me. We read Ender’s Game years ago – it my first sci-fi book, so I was skeptical. But I LOVED it, and now I read lots of sci-fi. 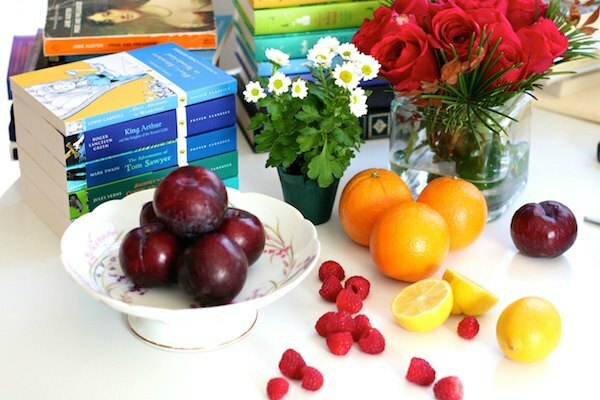 We also read a couple of re-told fairy tales also – I loved those and now it’s one of my favorite genres! You just never know. 🙂 Blind dates with books (or book clubs that force you to read beyond your normal genres) are a great idea! I’m glad you liked My Brilliant Friend. I guess I only gave it about 40-50 pages or so, and then I just had to stop. All those names and it just wasn’t going anywhere, or so it seemed to me. 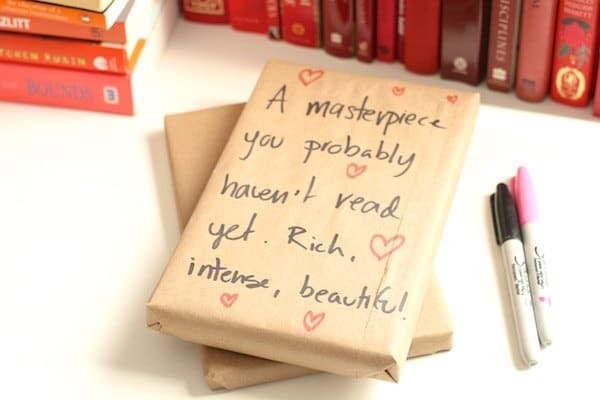 I don’t think I’ll try it again (that whole so many books so little time) but I do like the idea of the book blind date. Very fun! Our library did this for Valentine’s Day, and it was so much fun! Wish I could share a pic here. They wrapped them up in purple paper, affixed a “Personal Ad” and taped a Dove chocolate to the front. The book was The Angelmaker. I’m halfway through, and it’s pretty good. Definitely not something I would have picked on my own! I plan to try the “Blind Date” display at the library I work at. I think the patrons might enjoy it. Thanks for all the comments! I like that yours has the description on the front. Ours was just completely blank……..that makes no sense to me. So like a seriously blind blind date? That sounds scary! WOW Loved this, the idea and the post! I have now incorporated the idea into my classroom and pinned it with a direct like to your site. Eeep! This sounds amazing – I wish my bookstore did it! One thing though – were you worried you’d get something you’d already read? I read so much… and I know you do too… that it seems likely. Yes, I was! When my husband saw the book’s description he asked me the same thing. My bookseller accepts returns, so I’m sure I could have just returned it. I’m really curious what the first one was…with the lonely man and mysterious woman! I am looking forward to opening it up early tomorrow morning. I am curious to discover what it is.and then to dive into reading it with a good cup of tea . I decided I liked the “Cold, lonely man, mysterious woman…” for a winter read, so I checked out A Reliable Wife from the library. However, the “family series” was misleading: as far as I can tell, there are not more books, making this a series; and it is not family friendly reading! Almost pornographic in detail. I still thought it was well written, but my blind date turned out less modest than I would have hoped. Yes! King’s English bookstore in Salt Lake City has blind date books! They are ARCs they receive and can’t sell so you make a donation towards a charity and pick a book! It just had the genre written on the front. I got The Muse and Fourth of July Creek- haven’t read them yet but looking forward to it! Yes! Just two days ago at Malaprop’s in Asheville. I had picked out 5 or so books that interested me before I saw the “blind date” display. I was so enchanted by the idea as well that I put the 5 books back and chose my favorite description: transcendent, hopeful, gorgeously evocative, bittersweet, vital, striking, compassionate. I unwrapped the book as soon as I purchased, snapping and texting pics for my 3 bookloving girlfriends along the way. “Tell the Wolves I’m Home.” One of my original five! The first chapters hooked me fast. I will definitely take the plunge again if given another opportunity!